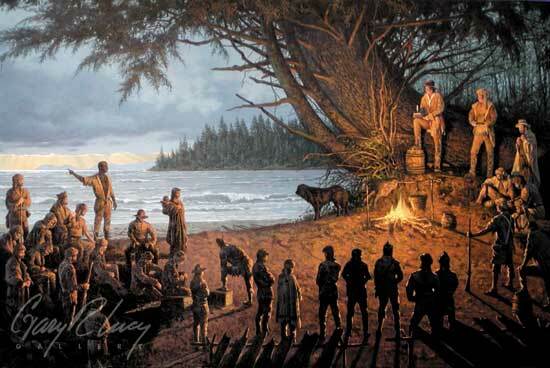 My most recent painting is, for now, my final work dealing with the subject of Lewis and Clark. The Vote is an interesting event that took place at the mouth of the Columbia River. There were thirty-one men, one woman, one baby, and one big dog camped at a location the crew named Station Camp. This camp, located on the northern side of the river, was a welcome respite from days of endless rain and wind. Lewis writes in his journals that he is becoming worried about the physical welfare of the men because their leather clothing is literally rotting off their bodies exposing their skin to the elements. It is very apparent that winter quarters must be found. The Captains asked the members of the expedition to vote for the location where they felt the living conditions and food supply would be best. All members had a vote including York and Sacajawea. It is thought that because the vote was sanctioned by a ranking member of the United States Government, Meriwether Lewis, this action would have marked a milestone denoting one of the first black men and one of the first women to vote in this country. As we view the painting, we see York standing, speaking, and pointing across the river, thus, making his vote known.